Acidic drainage from the inactive Copper Bluff mine cascades down a steep embankment into the Trinity River, on the Hoopa Valley Reservation in northern California. The Copper Bluff mine produced about 100,000 tons of sulfide-bearing copper-zinc-gold-silver ore during 1957–1962. 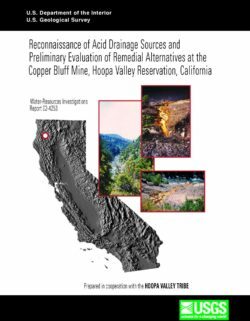 This report summarizes the results of a water-resources investigation begun by the U.S. Geological Survey in 1994 with the overall objective of gathering sufficient geochemical, hydrologic, and geologic information so that a sound remediation strategy for the Copper Bluff mine could be selected and implemented by the Hoopa Valley Tribe. This study had the following specific objectives: (1) monitor the quality and quantity of the mine discharge, (2) determine seasonal variability of metal concentrations and loads, (3) map and sample the underground mine workings to determine sources of flow and suitability of mine plugging options, and (4) analyze the likely consequences of various remediation and treatment options.